Chanteur Country US né le 24 Février 1958 à Kaplan (Louisiane). 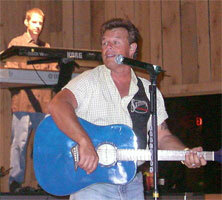 Sammy Kershaw est un des cousins du fiddler Doug Kershaw. Sammy Kershaw rode in on the new traditionalist wave in the early '90s, finding success with a penchant for ballads and a blend of updated honky tonk (especially the Vocals stylings of George Jones), Southern rock, and a hint of Cajun flavor. But as his career progressed, Kershaw moved farther and farther into crossover-minded country-pop, which actually eroded his early following. He was born in 1958 in Kaplan, Louisiana, in the heart of Cajun country; in fact, his third cousin was legendary Cajun fiddler Doug Kershaw. He got his first electric guitar at age 11 from his grandfather, but sadly, his father passed away not long after, forcing Kershaw to get professional as quickly as he could. He debuted at age 12 with local bandleader J.B. Perry and often worked for Perry as both a musician and roadie during his teenage years, touring the Southern club and honky tonk circuit. In 1980, Kershaw moved to Oklahoma with his wife and worked a day job while singing in local bands. However, his marriage fell apart two years later, and he returned to Louisiana, where he went through a succession of day jobs, remarried in 1985, and joined a touring club band called Blackwater in the mid-'80s. Unfortunately, the honky tonk lifestyle took its toll on Kershaw, who developed major problems with drugs and alcohol. In order to save his marriage, he quit everything cold turkey in 1988 -- including the music business, taking a full-time job at Wal-Mart as a supervisor of store remodeling. However, his songwriter friend Barry Jackson convinced him to submit a demo tape to Mercury Records in 1990, and after a showcase performance, Kershaw finally landed the record deal he'd spent so long pursuing. 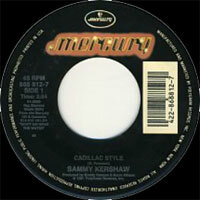 Kershaw's debut album, Don't Go Near the Water, was released in 1991 and spawned the breakout hit single "Cadillac Style," which reached number three on the country charts the following year. The title cut and "Yard Sale" both charted in the Top 20, and "Anywhere but Here" became his second Top Ten hit in 1993, helping the album go platinum. Later that year, Kershaw issued his second album, Haunted Heart, which many critics and fans still regard as his finest. The lead single, "She Don't Know She's Beautiful," became Kershaw's first number one hit, and its three follow-ups -- the title track, "Queen of My Double Wide Trailer," and "I Can't Reach Her Anymore" -- all went Top Ten; plus, the album became his second straight million-seller. Building on that commercial success, Kershaw began his shift away from hard honky tonk and toward more radio-friendly contemporary country with his next effort, 1994's Feelin' Good Train. He scored two number two hits with the anthem "National Working Woman's Holiday" and a cover of the Amazing Rhythm Aces' country-rock hit "Third Rate Romance"; plus, the album featured a duet with his longtime idol George Jones on "Never Bit a Bullet Like This." At the end of the year, Kershaw released a holiday album, Christmas Time's a Comin'. Kershaw returned in 1996 with Politics, Religion and Her, which found his sales beginning to slip a bit. Even so, he managed two Top Ten hits off the album: "Meant to Be" and the novelty song "Vidalia." 1997's Labor of Love was a ballad-heavy affair that returned Kershaw to the Top Ten of the country album charts; its "Love of My Life" became Kershaw's last big hit to date, peaking at number two. Even so, Kershaw's albums were growing increasingly uneven and pushing him farther into adult contemporary territory. That was especially true on 1999's Maybe Not Tonight, which found him covering '70s soft rocker Leo Sayer's "More Than I Can Say"; he also duetted on the Top 20 title track with Lorrie Morgan, who became his third wife in 2001. That year, they teamed up for the duet album I Finally Found Someone. Neither it nor Kershaw's last solo album produced any big-time hits, and he wound up parting ways with Mercury in the aftermath. He went on to sign with Koch subsidiary Audium, a newly established home for many country veterans of the '80s and '90s. His first album for the label, I Want My Money Back, was released in 2003 and the title track made it into Billboard's Country Top 40, but the record soon slipped down the charts. Audium closed a little while after the release of I Want My Money Back and Kershaw moved over to Category 5 in 2006, where he released Honky Tonk Boots in June of that year; it generated no hits and the label folded in 2007. After these two records, Kershaw spent some time pursuing a political career, running for lieutenant governor of Louisiana as a Republican in that state's 2007 primary. He came in second in the election; he attempted to run again in 2010 and came in second that year, as well. Also in 2010, Kershaw returned to music, releasing the Buddy Cannon-produced Better Than I Used to Be album on Big Hit Records that summer. Two years later, he released his second holiday album -- A Sammy Klaus Christmas appeared on MRI that October -- and in 2013, Kershaw set out on the road with Joe Diffie and Aaron Tippin on a tour called All in the Same Boat; the trio released an accompanying album of the same name in May. In 2014, Kershaw paid homage to one of his heroes and greatest influences with the album Do You Know Me? A Tribute to George Jones, which featured 13 classic tunes associated with the country icon as well as one new composition from Kershaw, "The Route That I Took." In 2016, Kershaw returned with a new solo album, I Won't Back Down, which marked the first time he produced his own sessions. 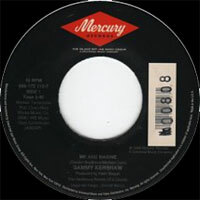 The album included covers of hits by R.B. Greaves ("Take a Letter Maria") and Tom Petty (the title song), as well as a celebration of barbecuing, "Grillin' and Chillin'." 1980 SP MASTER TRAK 3005 (US) . 1986 SP MASTER TRAK 3047 (US) . 1986 SP MASTER TRAK 3054 (US) . 1992 SP PAULA 457 (US) . I Just Ended Up Hurting Myself / ?